When you author a custom control that contains child elements, you should call the Arrange method of each child object within your ArrangeOverride method. 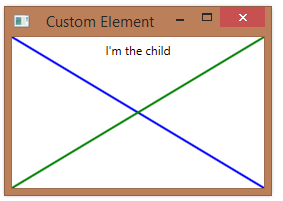 Below is an example, from a custom element with one child. The parent control has a dependency property, ChildProperty, representing the single child element. Below is a second example, from a custom panel that renders a treemap-like element. The ChildrenTreemapOrder method returns an enumerable of ChildAndRect objects. 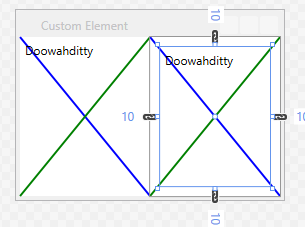 A FrameworkElement provides the VisualChildrenCount property and the GetVisualChild method, typically used during layout to walk through the child elements of the element participating in layout. When you create a custom control that derives from FrameworkElement, you typically override both members, providing values that make sense for your control. 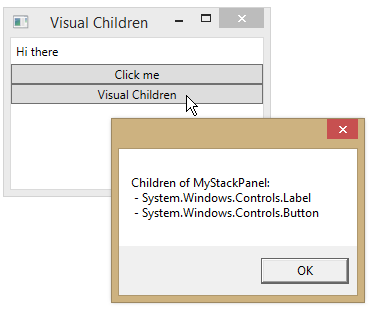 Below, we use these members to get a report of the visual children of a custom StackPanel. (Because neither member is public, we override StackPanel to allow access). 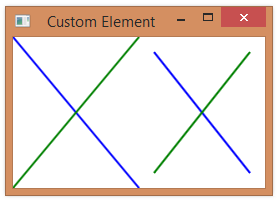 For example, below we have a custom element that draws a big “X” using all of the available space. (When rendering, it uses ActualWidth and ActualHeight). Because it will use as much room as it is given, MeasureOverride‘s return value is all of the available space.